Courtesy of California Olive Ranch. 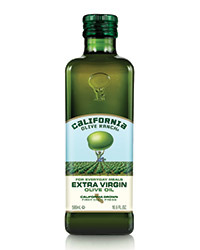 “Whoa, did you splurge on spendy olive oil?” my husband asked me recently while eating a very simply dressed salad. I hadn’t, actually. I had just tossed the greens with the California Olive Ranch (COR) Everyday oil I had picked up on a whim for about $10. The oil was so fresh and fruity—it really did taste more expensive. On the back of the bottle, I noticed a harvest date—something most olive oil producers leave as a mystery unless you’re paying top dollar. That harvest date—it matters. In general, the more recent the harvest, the better the oil tastes. For example, I once tasted COR’s 2010, 2011 and 2012 oils at the same time. The 2010 was definitely more muted. The 2011 was still delicious, but the 2012 was even more vibrant. It also helps that COR rushes its olives from the fields to the presses so they’re turned into oil within hours. I may never spend more on olive oil again.